Moving into the last years of life can be a very stressful time. With independence declining and medical issues affecting both body and mind increasing, transitioning through the last stages of life is often overwhelming and frightening. 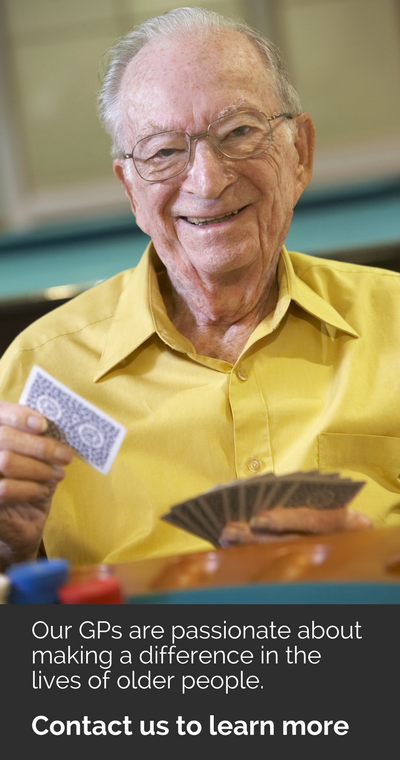 Our model of care has been designed to enrich the lives of residents living in residential aged care facilities. Our GPs are experts in aged care and are passionate about making a difference in the lives of older people. Our GPs work in partnership with aged care facilities and work closely with their multidisciplinary teams. They will carry out comprehensive medical assessments, contribute to care plans and case conferences, collaborate with pharmacists on medication management, and ensure comprehensive handovers take place. Our GPs encourage and empower residents to be involved in their care plans as much as possible. They will spend time with family members to ensure they have a thorough understanding of the resident’s medical conditions and what to expect as they move through their last years of life. The close relationships our GPs develop with residents enables them to be responsive in their medical care and advice with the aim of reducing hospital visits. Our GPs dedicate time developing Advance Care Plans and will ensure the resident and family members are involved and understand what will happen. Providing dedicated aged care service enables our GPs to provide a reliable and consistent service, high continuity of care, and to reduce stress for residents and their families. Our model of care provides a mobile and highly accessible service and even if a GP isn’t scheduled to visit, a resident or family member is always welcome to call or email us. For out of hours and weekend GP medical care we have cover arrangements with locum services. If you would like to use Aged Care GP as your regular general practice service, please complete our Patient Registration and Medical Consent form. We are also more than happy to organise a time to meet with you to discuss our service in more detail and answer any questions you have. Residents with a valid Medicare or DVA health card will be bulk billed.